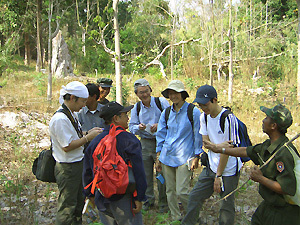 Following the overseas workshop at the Department of Agriculture and Forestry of Savannakhet Province (see MASUHARA Yoshiyuki’s report), a study tour was conducted for the purpose of making visits to investigate the use of ecological resources and land in farming villages in Laos. Two ASAFAS faculty members (IWATA Akihisa and TAKEDA Shinya, both associate professors), four ASAFAS graduate students (KUROSAKI Ryugo and SHIRAISHI Soichiro, both from the Divison of African Area Studies; and KIGUCHI Yuka and myself from the Division of Southeast Asian Area Studies), a graduate student of Kyoto University Graduate School of Letters (NAKATSUJI Susumu) and a staff member of the Department of Agriculture and Forestry, Savannakeht Province (Mr. Petsamay) took part. During the two-day tour, we moved from midland Laos to northeastern Thailand. On February 11, we left the town of Savannakhet for Kenkokdong Village, Champhone district, where we visited the district’s Department of Agriculture and Forestry. We then visited Bak village in the same district. On the following day, after visiting Taleomai Village in the same district, we returned to the town of Savannakhet, crossed the Mekong River and moved to Mukdahan in Thailand. We observed land use in northeastern Thailand from our car as we traveled from Mukdahan to Ubon Ratchthani, where we ended our tour. Champhone district, the target of the study tour, has 167 villages and a population of 86,612 in an area of 84,400 hectare. It is one of the largest districts in Savannakhet Province. Bak Village and Taleomai Village, which we visited during this trip are about six kilometers away from Kenkokdong Village, the district’s capital. Bak Village of Lao people, which we visited on the 11th, has a population of 1,862 and a long history spanning 400 years. 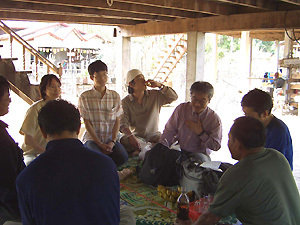 We conducted interviews there on the history of migration from northeastern Thailand and the resettlement when the village was established, and on the present livelihood situation. We also observed the land use (Photo 1). Taleomai Village, which we visited on the 12th, has a population of 821 and is populated by members of the Phu Tai tribe. It is said that Taleomai Village was established in the 17th century. During our visit, we listened to the village head talk about the present livelihood as well as their folk tales from the time when the village was established (Photo 2). welcomes us with distilled spirit. Further, we visited open-air morning markets in the town of Savannakhet and Kenkokdong Village in Champhone district to see the products sold there (Photo 3). Finally, we visited a bridge under construction over the Mekong, which serves as the border between Laos and Thailand (Photo 4). We also observed land use in northeastern Thailand from our car. Japanese ODA is being used for the construction of the bridge, which is scheduled to be completed in 2006. Generally speaking, northeastern Thailand is more advanced than midland Laos in terms of infrastructure and the introduction of cash crops, and the construction of this bridge is likely to have some impact on land use in Laos. 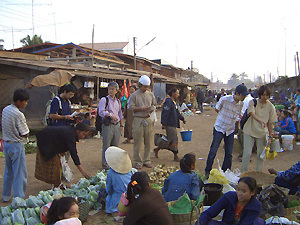 the morning market in Kenkokdong Village. 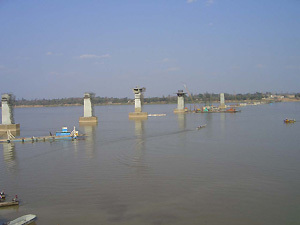 Photo 4: A bridge under construction over the Mekong. This study tour was short, and we did not make adequate preparations. However, it was meaningful in the three following ways. First, we gained new perspectives and information by working along with people engaged in researches in different areas and fields. Second, this study tour served as a preliminary preparation for the workshop that is being planned, mainly by the local people of Kenkokdong Village. And third, we confirmed that tracking changes in land use in midland Laos and northeastern Thailand before and after the construction of the bridge over the Mekong is an important study theme for the future.